Sharmilla Persaud and Arianna Brooke, l-r.
“I love coming to my office every day,” says Arianna Brooke, co-founder of MILLIANNA. Her office in downtown Spokane is just blocks from Riverfront Park with views of the roiling Spokane River. 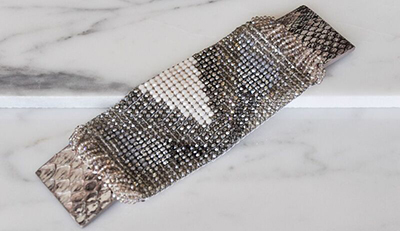 Next door to her office, a half dozen employees are carefully constructing beaded necklaces, earrings and bracelets, finishing them off with the distinctive python skin-clad closure that has become a signature of MILLIANNA designs. Brooke is a long way from the heart of the U.S. fashion scene, but she likes it that way. She and her business partner, Sharmilla Persaud, both cut their fashion teeth in the 1990s working in Los Angeles for one of the hottest fashion houses in the world — BCBG Max Azria. 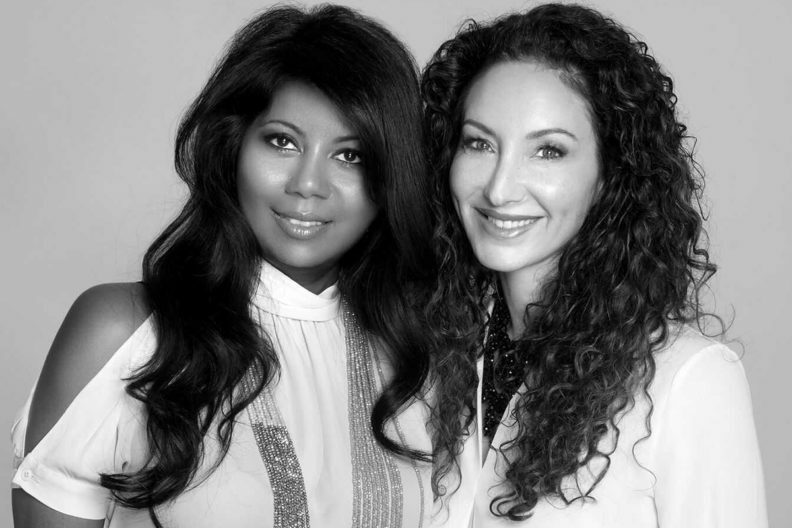 The two had been friends for nearly 15 years when they decided to join Brooke’s expertise in fashion marketing and administration with Persaud’s design talents to create their own company. Much of their collection features intricately beaded necklaces, earrings and cuffs that draw inspiration from diverse times, places and people, including Elizabethan England, the Art Deco movement, French designer Coco Chanel and Italian designer Elsa Schiaparelli. Miranda Lambert has worn their jewelry on stage, Rachel Ray has worn it on her television show, and Oprah has featured it in her magazine. Tia Leoni, star of “Madam Secretary,” wore one of their micro cuffs for an entire season, giving MILLIANNA a big boost. MILLIANNA was founded in Manhattan in 2011, but about five years ago the two decided to move administration, marketing and production to Spokane, where Brooke grew up. Persaud continues to live in Connecticut. Marketing the company from Spokane might not have been possible 10‑20 years ago, Brooke said, but things are changing. “What’s happening in the market right now is interesting,” Brooke said. For the past 60 years, to be successful you needed to get your collection into the best wholesale showrooms in New York and then you needed to get picked up by the top tier retail chains or pricey boutiques. But retail is suffering, Brooke said, “and the way people shop is changing. “We’ve had to pivot and focus more on direct-to-consumer outlets,” she said. With online sales gaining traction, they can do that from anywhere. Moving to Spokane enabled MILLIANNA to rent far nicer office and production spaces for far less money. Wages go farther in Spokane, too, Brooke said, so their employees, many of them immigrants from countries such as Nepal, Burma, Vietnam and Ecuador, stick with them. Pieces in the MILLIANNA collection are labor intensive and require skill to produce, Brooke said, so being able to find and retain good employees who become skilled artisans is critical. The benefit that might mean the most for the long-term sustainability of their company was when they connected with Alan Stanford, a certified business advisor with the Washington Small Business Development Center (SBDC) in Spokane. The Washington SBDC is a network of nearly 30 business advisors who work in communities across the state to assist small business owners who want to start, grow, buy or sell a business. SBDC advising is provided at no cost to the business owner and consists of confidential, one-on-one meetings scheduled over a period of weeks, months, or even years, to address challenges ranging from loan applications to cash flow management to employee hiring and retention. The Washington SBDC is hosted by Washington State University and receives additional state and local funding from other institutions of higher education and economic development. The SBDC also receives one-to-one match funding from Congress through an allocation to the U.S. Small Business Administration (SBA). Once settled in Spokane, Brooke said, sales were going well, but managing cash flow was a continual struggle. The lag time between buying materials and selling the finished product could be six months or more, meaning she often struggled to pay the bills during low seasons. Tia Leoni, star of “Madam Secretary,” wore one of their micro cuffs for an entire season, giving MILLIANNA a big boost. “Alan was just a godsend,” Brooke said. “His help was really fantastic.” Brooke said Stanford sat down with her and went over profit and loss statements and various spreadsheets. He was able to show her how to use historical data to plan for future expenses and start building a cushion to protect against feast and famine budgeting. For instance, Brooke had always thought it was important to avoid debt, but Stanford encouraged her to consider taking out a line of credit. “He said, ‘Believe it or not, most businesses have a healthy amount of debt,’” she said. Using her own spreadsheets, Stanford was able to explain what “healthy” debt looked like and why her business could support it. With Stanford’s assistance, Brooke met with several different banks to discuss a line of credit and then chose to work with Dominic DeCaro at Washington Trust in Spokane. DeCaro not only visited her office, Brooke said, but has become a customer as well. And growing is exactly what they intend to keep doing. MILLIANNA currently has 12 employees and introduces new jewelry collections twice a year. Their pieces are sold in select boutiques in the Northeast and across the country and at MILLIANNA.com. As part of their growth strategy they are developing a secondary line of accessories that continues the MILLIANNA aesthetic but offers a range of price points. They’ve also been working with Vern Jenkins, an SBDC export advisor in Spokane, to expand international sales. “His expertise and advice have been invaluable in expanding our idea of what we thought was possible in terms of manufacturing and sales,” she said. According to Brooke, MILLIANNA designs can be found in boutiques in Japan, Canada, South America and Canada. For additional information see the MILLIANNA and Washington SBDC websites.